At Stories from Science, we’re committed to protecting and respecting your privacy. No, seriously, we mean it. We recommend reading ‘Attention Merchants’ by Tim Yu. It’s no exaggeration to say that many of the biggest technology companies play fast and loose with your personal data, making billions every year out of harvesting your personal details. Protecting your privacy – and that of your family – is something we all need to take really seriously. So this Policy explains when and why we collect personal information about people who visit our website, how we use it, the conditions under which we may disclose it to others and how we keep it secure. We may change this Policy from time to time so please check this page occasionally to ensure that you’re happy with any changes. We’ll also try to update some of the jokes. By using our website, you’re agreeing to be bound by this Policy. Any questions regarding this Policy and our privacy practices should be sent by email to science@storiesfromscience.co.uk. A real person will answer your email and respond to any and all queries. Stories from Science is a creative digital platform, which seeks to build a community interested in science in Abingdon and the Science Vale. 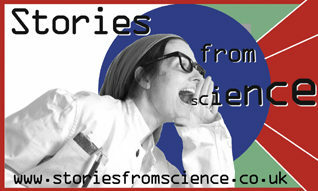 The core of the platform is the Stories from Science podcast, and it is run by Dr Mark Thornton. It literally is run out of his kitchen. Mark is an employee of Firefly Cage Ltd (no. 05794785), whose registered address is 35 Hobbs Close, Abingdon, Oxon, OX14 3UX. If you visit the Stories from Science digital platform, read our content and listen to our podcast, then we do not collect any personal information about you. However, we hope that you’ll think “Wow, what a great idea” and may subscribe and join our community. In this case, you may be using the crowdfunding platform Patreon, or paying via PayPal). We also run an email newsletter (with a third-party service called Mailchimp). In this case, we obtain information from you when you subscribe to any or all of these services via webforms. We may also collect information when you contact us to enquire about getting involved with the show, or how to get involved with our community. The personal information we collect might include your name, address, email address, IP address, and information regarding what pages are accessed and when. If you subscribe to paid-for Stories from Science products your credit card information is not held by us, it is collected by our third party payment processors, who specialise in the secure online capture and processing of credit/debit card transactions, as explained below. That last bullet point is a bit wordy, so here’s an example: if you are a subscriber through Patreon, we will hold your personal information as long as your regular subscription remains valid. However, we do use Third Party Service Providers who work on our behalf (most notably Patreon, PayPal and Mailchimp). In order to provide services to us and you, we may pass your information to our third party service providers for the purposes of completing tasks and providing services to you on our behalf (for example to process subscriptions and send you mailings). However, when we use third party service providers, we disclose only the personal information that is necessary to deliver the service and we have a contract in place that requires them to keep your information secure and not to use it for their own direct marketing purposes. Patreon: Patreon are one of the world’s largest and most trusted platforms to allow creators in every sphere of human artistic endeavour to get paid for their work through a crowdsourcing / reward model. You can read more about their third-party privacy provision here. Mailchimp: Mailchimp is also a world-leading company, only this time in the field of email newsletters. You can read about their third-party privacy provision here. Because Mailchimp are, like, the world leader in email marketing, they work extremely hard to protect their reputation in a world of spammers. Their privacy statement is enormous, but you’ll be wanting to scroll down to the bit that says ‘Safeguarding Your Information’ because that’s the bit that refers directly to the information we collect from you, and place in Mailchimp’s hands. If you have any questions regarding secure transactions and payments, please contact us. You have a choice about whether or not you wish to receive information from us. The default is always that you don’t unless you positively tick the relevant boxes situated on the form on which we collect your information, or if you select a service from us (e.g. a paid subscription) that requires us to communicate with you and let you know things that directly relate to your subscription (i.e. a new podcast has been published). You have the right to ask for a copy of the information Stories from Science holds about you. We may charge £12 for information requests to cover our costs in providing you with details of the information we hold about you. For at least another year (we wrote this policy in early 2018) the UK is still part of the EU, we’re very happy to say.